Nobody said breakups were easy. There’s so much you got to deal with after parting ways with your ex. And then there are those days when your heart is heavy because you’re really missing your ex and secretly wishing that they miss you too. Sounds like you? What if I told you there are some subtle but highly successful ways to get your ex to miss you? In this post, I will reveal 4 weird yet powerful tips on how to get your ex to miss you. But you need time to allow it to work its magic. To pick a leaf from my own life, let me share my own account of going through a breakup. I had just gotten out of a relationship and I remember being extremely happy and relieved during the first month. It felt like a huge burden was lifted from my shoulders and I suddenly felt so free and alive. I thought that I never wanted to see my ex again, never wanted to talk to him again, and never ever wanted to think of him again. I was busy and happy with my own life. It all seemed good for me! But come month two, things took a drastic turn and I was miserable. Whenever I would walk around the house, a sudden memory of him doing things around the house would pop up inside my mind. I would remember how he used to make breakfast for me, how we used to watch movies together and how we used to snuggle up before going to sleep. Small things like these kept popping up every now and then. It made me miss him a lot and I would get extremely emotional and call him up to talk. That’s what happened to me after I let some time go by. I genuinely started missing my ex. That’s why I say that you should allow time to do its thing. Let there be some distance between you and your ex after your breakup. You shouldn’t be constantly in their face or on the phone after your break up. This will only make them irritated with you as all they will remember is how it was the last time you spoke and feel annoyed. So, you need to have that distance to allow those happy nuggets of memories to emerge on their own and do its trick. This is a sure shot way to get your ex to miss you. Everyone has their unique traits or abilities. You are best at something at least! Maybe not everything but something! So, as your ex goes through life and meets different people or dates different people, this is going to come up. Your ex is going to miss you for that little thing that made you so special; something which no one else can do better than you. For example, these could be things like you being the best cook they’ve ever met, or you were the best lover they’ve ever had. Maybe you were the smartest person they’ve ever met and they always got to learn something new from you. This is true for everyone. Everyone remembers an ex who was “the best” at some particular thing in our lives. So will your ex! Many times, a memory of you will come up in their mind whenever that thing comes up in their life. It’s all about being confident that you have that best thing in you, which could be your unique blueprint or talent. Whatever you are best at, rest assured whenever that “thing” comes up for your ex, they will think of you and miss you. 3 & 4 are practical things that you can do. One of the most obvious things people do on social media after a breakup is start flaunting how happy they are by constantly posting pictures of themselves. People do such things with the hope that their ex will see it and miss them or regret breaking up with them. Ummm…NOT REALLY! I strongly recommend that you don’t do that! That’s not just obvious but also makes you come across as a boastful and attention-seeking person. Your ex will be able to see right through this game and will only be annoyed with you. Before even starting, you will lose the effect you wanted to see on your ex! Instead, start using the power of social media by taking the help of your friends or any third person! Ask them to take awesome pictures of you and then share them on their Facebook or Instagram. Let them tag you in those pictures so that they also show up on your timeline and your ex gets to see them. In the case of Instagram, if your ex is following your friends, asking them to share pictures of you will also ensure that your ex gets to see them! So, you’re essentially playing the same trick but it comes across as something totally different to your ex. What difference does it make when you post those pictures versus when your friends post them? Well, when you start clicking selfies or pictures of yourself being happy, it might come across as obnoxious behaviour. But when your friends do it, it shows that you had no interest in seeking attention. It will instead portray you as a humble person, who likes to keep things low profile without trying to spam everyone’s news feed. It’s 10x more powerful having other people tag you then you tagging yourself! This small trick makes a whole lot of difference! More than you can imagine! Note: Avoid clicking and posting selfies. Okay, this one might sound super sneaky or weird but trust me it works like a charm! For some reason birthdays can make people very emotional. It’s such a special day for a person that they secretly expect things from others on their birthday. Even though they hate to admit it! But hey, they really do! Everyone likes to be the centre of attention on their own birthdays and so does your ex. And this is a good occasion to try Tip #4. So go ahead and make your ex feel special on their birthday! But do it ONLY ONE DAY LATER. If you send them a card or flowers on their birthday, it’s nothing unexpected. You will be one amongst the hundreds who will be sending something to your ex. You’ll have to get in line and your effort might go completely unnoticed! So, don’t do the obvious. Instead send them a gift or a card one day or two days after their actual birthday. Make your ex mistakenly think you’ve forgotten their birthday and then surprise them afterwards. Your ex will get to open your card separately and without 10 other cards competing for their attention. It will bring up a flood of “untapped” emotions and totally make your ex miss you! Just be careful not to expect an immediate response from them. But be sure that it’ll get your ex to miss you! Trust me, this happened to me on my own birthday! My ex had sent me a card a day later and it got me really emotional and teary. Note: Mention a reason for sending the card or gift a day late. Say something like you not sure whether it’s right to send them a gift or disturb them. Pssst… if your ex is a SHE, remember women love flowers! 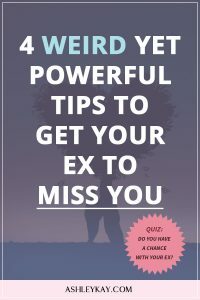 Now that you know about the 4 weird yet powerful tips on how to get your ex to miss you, make sure you try them out and share your experience with me! Tip #3 & tip #4 are quite practical, so you should be able to do it easily! Previous Post: « If You Dumped Your Ex, Can You Get Them Back?